A casual weekday dinner, what to eat? 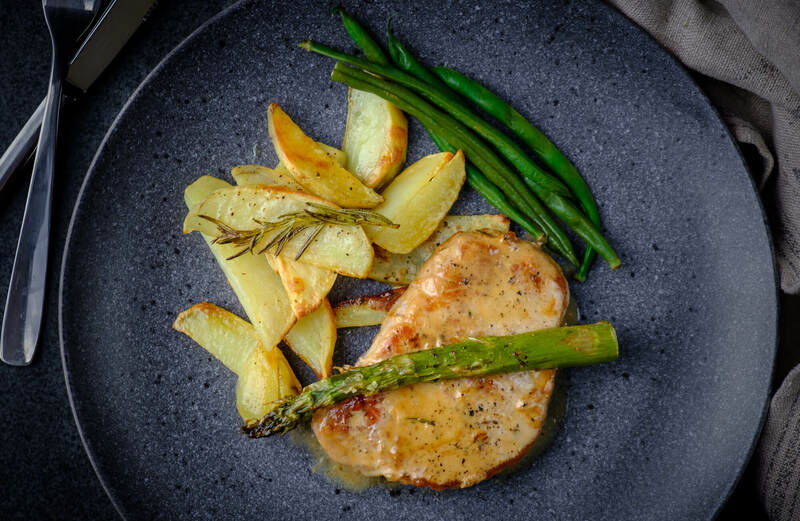 I decided to use the pork chops that I bought my mistake and did a meal with pork chops cooked in a creamy sauce served with some delicious asparagus and oven baked rosemary potatoes. Delicious even if it’s a simple meal! Summary: A delicious dinner with pork chops cooked in a creamy sauce, served with oven baked rosemary potatoes and asparagus. Preheat oven to 225 Celsius Degrees. Cut the potatoes in quarters and place in a bowl with olive oil, fresh rosemary, pepper and salt. Put the potatoes on a baking sheet and bake for around 40-45 minutes. Flip twice during the cooking. Salt and pepper the pork chops and heat a frying pan with some butter. Add some fresh rosemary. Fry the pork chops for 5-6 min on each side. Chop the onion and fry in some olive oil. Add the red wine and let it simmer until almost everything is gone. Add the broth and cream and let it simmer for around 5 minutes. Add the sauce to the frying pan and let the pork chops simmer for around 5 minutes. Fry the asparagus 2-3 min on each side and serve.